We Act Radio rejoins the air waves 9/14 with the premiere broadcast of We Luv Books Radio. Maya Gonzalez, author, educator, and co-founder of Reflection Press. Author of When a Bully is President, to be highlighted at 9/23 ARTivisim Afternoon bookstore event. Ashton Wingate represents the DC Public Library and its 9/16 program, “Sing Talk Read” which focuses on literacy for our youngest community members. HOSTS: LJM, educator and founder of DC Bookapalooza, and Virginia Spatz, feature reporter on We Act Radio’s Education Town Hall. “We need a literacy oasis here,” says LJM, organizer of DC Bookapalooza and co-host of the We Act Radio‘s newest program, “We Luv Books,” launching September 7 and 14 at 7 p.m. “We have a literacy crisis in DC, especially east of the river. The reality is that our children don’t have access to resources and tools which prepare future generations for 21st century skills.” Co-host Virginia Spatz, also feature reporter for We Act Radio’s Education Town Hall, adds that research well documents how improved literacy is key to addressing generational poverty, as well as high crime and violence. Freeman notes that a 31-year-old Southeast resident was murdered just down the block on August 14, and the station itself has suffered three break-ins in its five-year history. 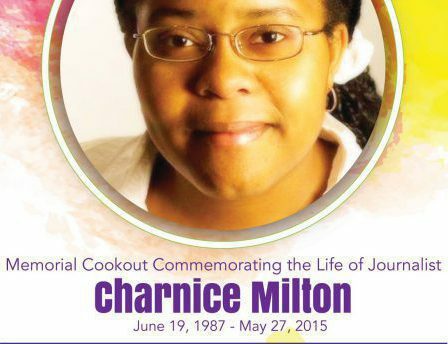 Moreover, the bookstore is named for 27-year-old journalist Charnice Milton, who was shot to death not far from the station in 2015. We Luv Books will be the first programs broadcast, following the devastating break-in on August 23 that crippled We Act Radio operations for weeks.